With the main focus on the cultures and traditions of the ethnic Tamang people of the Langtang valley, the Tamang Heritage Trail is a beguiling journey of amazing mountain peaks, glaciated acreages, and untouched settlements that whose people still practice the ancient Himalayan way of life. One of the best trekking regions of Nepal is the gorgeous Langtang region, and the Tamang Heritage Trail is one of the best off-the-beaten-path treks of said region. The 16-days journey begins as you are introduced to the rich culture in the Kathmandu valley and make way to Sybrubensi, the starting point of the Tamang Heritage Trail. With the trail that diverts away from the Langtang National Park and instead meanders towards the Tibetan border, the Tamang Heritage Trail presents many dainty settlements and Tamang villages like Gatlang, Goljung, Chilime, Thuman, Timure and Briddhim. Trekkers can experience unique customs of the people and gain insight into the lives of the ethnic groups. With the perseverance of ancient cultures and traditions intact, the trekking journey presents experiences of unique rituals and practices of the local Tamangs. Moreover, the path is also adorned with many monasteries, Gumbas, Chaityas, and Bihars that line the trail quite beautifully. One of the unique features of the Tamang Heritage Trail is the settlements where the houses are decorated opulently with intricate carvings. The people of the villages weave baskets and hand-make a wide array of handicrafts which the trekkers can enjoy as they pass through. The people also dance and sing old folk songs in unique dialects and dress up in traditional Tamang attires. The journey is quite suited for trekkers who are looking to explore the cultural aspect of Nepal. 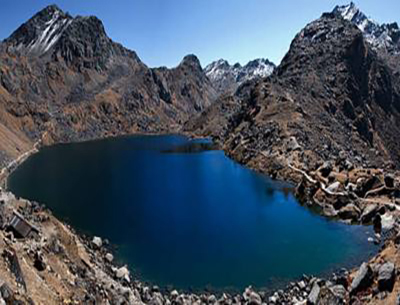 In addition, trekkers can also enjoy the cerulean lakes along the journey, like the Parvati Kunda, along with majestic views of mountains like Jugal and Ganesh Himal peaks. It is an easy cultural trekking journey that can be done during the time of the spring and autumn months. Be our guests at Destination Unlimited as we accompany you through the trail into the outer reaches of the Langtang Valley. We put your safety and comfort on the top of our priority so that your travel can meet the expectations of a fantasy trek you made. You may arrive at Kathmandu at any time. Upon landing at the airport, you will be escorted to your Hotel in the city. Overnight stay at the Hotel. Today, you will have a sightseeing tour of the Kathmandu city. The city has many historical and religious sites, many of which are also included in the UNESCO World Heritage Sites’ list. You will visit the Swayambhunath Stupa- a revered temple atop a hill that is held sacred by both the Hindu and the Buddhist people of the country, the holy Pashupatinath temple that is located beside the Bagmati River. Alternatively, you can also visit the Boudhanath Stupa in the city as well- a religious Buddhist monastery that has beautiful Buddhist decorations done on murals and paintings. After the tour, you will be transferred back to the Hotel. Overnight stay at the Hotel. You will have a drive from Kathmandu to Sybrubensi today. Heading north out of the city, you will be driving through scenic foothills. The drive also passes by high ridgelines and presents sights of the countryside life of Nepal. Passing through Dhunche, you will reach Sybrubensi. Along the way at the bank of the Trishuli River, you can get amazing glimpses of the Ganesh Himal (7422m). Overnight at guesthouse. From Sybrubensi, you will trek through the hill and towards Gatlang, passing by many small settlements along the way where you can observe different traditional village life of the locals. The village of Gatlang is set high on a hillside among terraced fields. 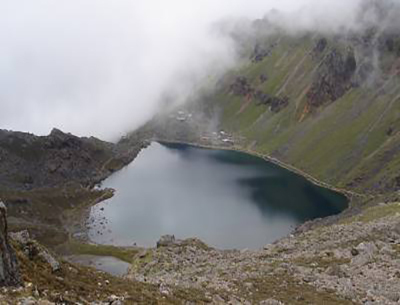 Upon reaching Gatlang, you can visit a Tamang monastery here as well as the beautiful the Parvati Kunda Lake. Overnight at guesthouse. On the way to Tatopani, you can enjoy mesmerizing sights of the Langtang range and the Ganesh Himal (7422m). You will follow the trail running along the Chilime Khola. The Tamang culture at Tatopani, which translates to “hot water”, is quite beautiful. The village of Tatopani has natural hot springs that are known to relieve aching muscles. Overnight at guesthouse. From Tatopani, you will then have a beautiful trek along the verdant woods of the valley towards Thuamn via Timure- an old trade route settlement to Tibet. At Timure, you will also pass a fort that is a historical reminder of the Nepal-Tibetan relations that has existed for many centuries. Overnight at guesthouse. From Thuman, you will trek along the valley's edge line all the way to Briddhim- a Tibetan Buddhist village situated on the lap of the Langtang Himal. Here, the houses of the village are spread in a Z-shape across the land with most of the houses made up of stones with split slates for the roof. The village's people are direct descendants of the ancient Tibetan immigrants. Overnight at guesthouse. Today, you will trek from Briddhim to the Lama Hotel. The trail descends down to Ghopcha Khola- a small stream and then ascends up again towards Lama Hotel via Rimche. The Lama Hotel is located on the banks of the Langtang River, surrounded by verdant oak, maple and cedar forests with amazing mountain views. Overnight in Lama Hotel. After breakfast, you will continue on the trail to the Langtang Village. Winding alongside a dense forest, the trail climbs up steadily through the valley. On the way, you can also enjoy the marvelous views of the Langtang Lirung Himal (7227m). The terrain is ornamented with water mills, prayer wheels, and Chortens with sacred mounds of inscribed rocks. Overnight at guesthouse. Leaving the Langtang village, you will walk through yak pastures, passing by the largest Mani wall in Nepal. You will then cross several wooden bridges before reaching the Kyanjin Gumba. It is beautifully surrounded by the Himalayas. You can walk around the Kyanjin Gumba, taking in the astounding views of glaciers, icefalls, colorful birds and grazing yaks. Overnight at guesthouse. Today, you will have a rest day at the Kyanjin Gumba. 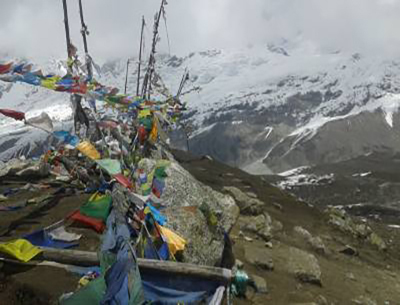 You can visit the Langsisa Kharka today, or alternatively even hike up to the Langtang Lirung Glacier. There is also a ridge that is situated a few distances away from the Gumba called the Tserko Ri (4984m) from where you can get amazing views of the Langtang valley and surrounding mountains like Langshisa Ri (6,810m) Langtang Lirung (7,227m), Gangchempo (6,888m), Naya kanga (5,844m), and other numerous peaks. Overnight stay at the guesthouse. You will trek back to the Lama Hotel. The trek is mostly downhill, passing through forests and meandering alongside a beautiful mountain river. During the trek, you will pass through villages like Langtang, Chyamki, Ghodatabela and Gumanechok. The trail is engulfed by oak and rhododendron forests. Overnight in Lama Hotel. After breakfast, you will trek down to Sybrubensi to Thulo Syabru, which is an easy trek through dense green acreages. You will first reach Bamboo village following the trail stretching parallel to the Langtang Khola. You walk past numerous hotels and a landslide-prone area to reach Thulo Syabru. You can observe the living of the people while you make way to your destination for the day. Overnight stay at the guesthouse. From Thulo Syabru, you will make your way towards Dhunche, a small settlement where you can buy small handicrafts and hand-made baskets that are weaved by the local people. The path to Dhunche first takes you across monasteries such as Phulung Gompa and Shin Gompa. You will walk on the steep trail before reaching Dhunche. Overnight stay at the guesthouse. After breakfast, you will drive back to Kathmandu, passing the ethnic Tamang villages and the terrace farms, driving alongside the river. You can explore the local marketplaces and alleys upon your arrival in Kathmandu. Also, you can do shopping or rest as you desire. Overnight in Kathmandu. Approximately three hours before your scheduled flight, you will be transferred back to the airport from where you will depart.